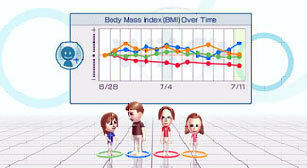 The emergence of 'active' computer gaming with Nintendo's Wii Fit, has essentially changed home entertainment forever, as it continues to dominate the top of all Games format charts (Edge magazine January 2009). The Wii Fit is just one of a number of games developed as part of Nintendo's 'Wii' series; others include Wii Play, Wii Chess and Wii Sports and Wii Music. In case you have somehow managed to miss the massive marketing campaign over the last 12months, here is an easy-to-understand overview of the Wii Fit and all it involves. Do I need any other equipment to get started? The Wii Fit uses a unique platform peripheral termed the 'Wii Fit Balance Board' which comes as standard on initial purchase. It is pressure sensitive, wireless and senses shifts in a person's weight and balance. This then allows individuals to calculate their body mass index (see figure A), interact with over 40 different games, compare different player's fitness levels and even calculate and track your ''Wii Fit Age'' based on your current age, weight and athletic ability. Yoga - to target your balance and flexibility with various yoga poses including the cobra, bridge, warrior pose and sun salutation. Strength training - muscle-toning exercises including single leg extension, lunge, push ups, triceps extensions and side planks. Aerobics - activities that aim to elevate your heart rate like hula hoop activities, rhythm boxing (which is similar to step aerobics) and free run. Balance games - to challenge your body control these balance-based games include ski slalom, football heading, penguin slide and tightrope.